St. Agnes church in Roeland Park has been at the center of debate of the city’s temporary sign ordinance. 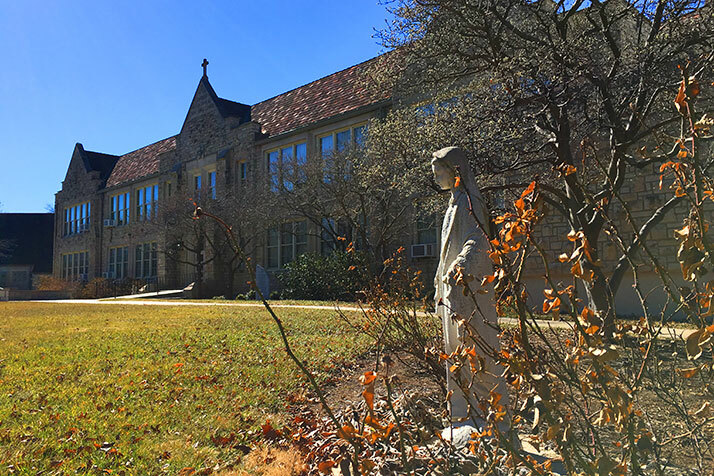 Changes to Roeland Park’s temporary sign ordinance that will accommodate St. Agnes Catholic Church’s annual abortion awareness display were narrowly approved by the city council Monday with a vote of 4-3. Councilmembers Sheri McNeil, Tim Janssen, Michael Rhoades and Ryan Kellerman voted in favor of updating the ordinance and councilmembers Becky Fast, Erin Thompson and Teresa Kelly voted against it. Councilmember Michael Poppa previously voted against changing the ordinance but was not present at Monday’s meeting. The updated ordinance will allow schools, churches and other nonprofit organizations to advertise for a special event by posting an unlimited number of signs for up to 31 consecutive days for a maximum of 60 days per year. While the number of signs is unlimited, the entire event display cannot exceed 500 square feet or 5 percent of the total square feet of the property, whichever is less. The sign limitations apply to addresses so that nonprofits with multi-building campuses can have more signage. The original ordinance limited nonprofits to posting three signs for four days. City staff proposed amending the ordinance in late 2016 after the city’s attorney determined that St. Agnes’ annual month-long display of roughly 40 small crosses violated existing code. During Monday’s meeting councilmember Becky Fast expressed concerns the changes would allow nonprofits operating out of homes to post a large amount of yard signs. “We don’t differentiate between a commercial area and a residential home area,” Fast said. Assistant city administrator Jennifer Jones-Lacy said to her knowledge there were not currently any nonprofits operating out of homes in Roeland Park.